Way1.Delete photos one by one: 1.Tap the photo you want to delete from the thumbnail list. 2. Tap the pencil icon, a feature bar will show up. 3. Tap the trash can icon(the forth icon from left) to delete current slide. 4. repeat step1 to step3 to delete other photos. Way2. Delete photos in batch: 1.Tap any of the photos from the thumbnail list. 2. Tap the pencil icon, a feature bar will show up. 3. Tap the arrange icon (the third icon from left). 4. 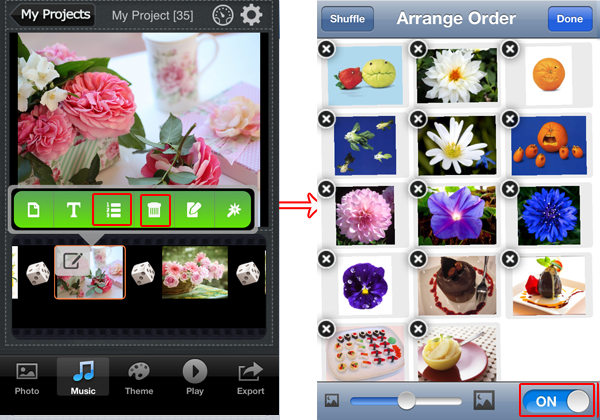 In the Arrange Order window, toggle the on/off slider to ON, a X will appear at each photo's left top corner. 5. Tap the X to delete photos you do not want to use in the slideshow.